“He has done nothing to harden those assets,” state Sen. John Moorlach, a Republican, told The DCNF. 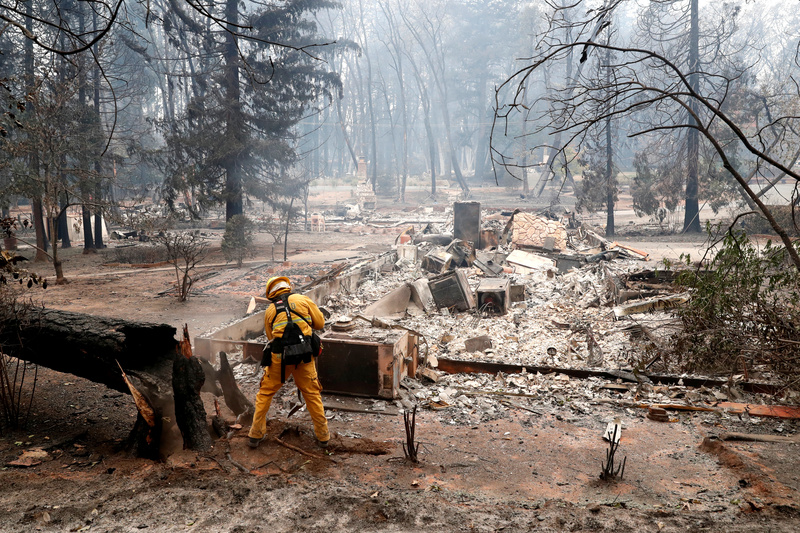 A firefighter extinguishes a hot spot in a neighbourhood destroyed by the Camp Fire in Paradise, California, U.S., November 13, 2018. REUTERS/Terray Sylvester. 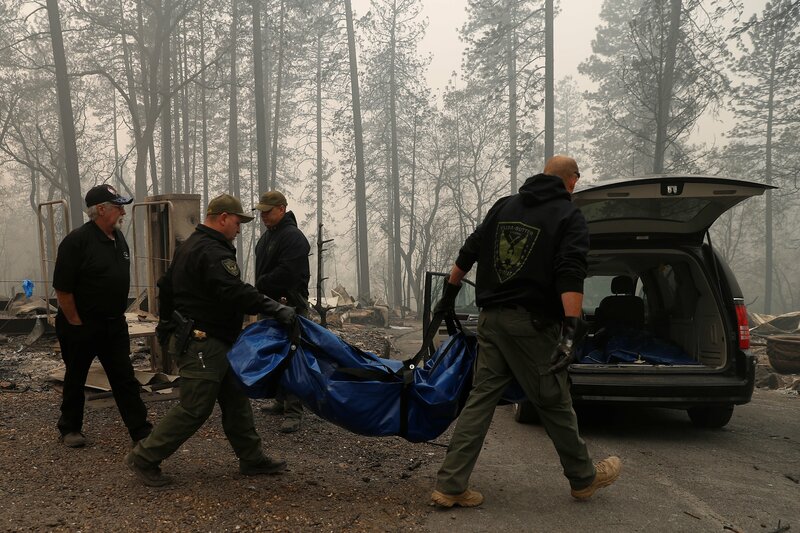 Yuba and Butte County Sheriff deputies carry a body bag with a deceased victim during the Camp fire in Paradise, California, U.S. November 10, 2018. REUTERS/Stephen Lam. In typical Dem style, Brown didn’t address preventive measures when he could have, but instead he later chose to throw more money at the problem, except that it was too late. So where do they go next for help? Back to the Feds for more taxpayer funds, of course. That means we all pay for the damages in California. Had the forests been managed properly none of this had to happen, and now there are dozens of people dead and thousands of people without homes. Meanwhile Brown and SoCal Edison deny responsibility which is also the typical Dem reaction. Ultimately though, the responsibility belongs on the voters of California who keep electing more Democrats in spite of the evidence that they’re incapable of leadership and and prioritizing the issues. They don’t learn from history and neither do the leaders they elect. A friend who lived in CA for 30 years, but moved away, tells me “Trump is Right”… I assume she means about CA being responsible in part. She also shared this link http://www.ppic.org/blog/ managing-forests-to-reduce- wildfire-risks/#.W-4HwxmQmew @MikeTokes (twitter) also has some very interesting tweets on the topic. The link won’t open but I have seen similar pieces along the same lines and today there was a video showing some areas where the underbrush and fallen trees were quite thick. If the whole forest area is like that, it’s no wonder half the state is going up in flames. If protestors ever had a good reason to gather at the capitol, this is it. That’s a good article, and this statement stood out. “Others are concerned that this approach (vegetation management) could result in a weakening of important environmental protections. Whatever the effect of that weakening would be, it is far less devastating than forest fires. It’s proven that California could very much lessen the fires they have. But they don’t. It’s like when they let out all the water stored for draught just to save a lizard. Liberal insanity. Insanity is exactly right, tannngl. They rely so heavily on others’ money while wasting their own and they’re protecting all the wrong things. And judging from the results of their election, things aren’t going to change any time soon. “Conditions leading up to the 1889 fire included a much longer and more severe annual drought than usual, with rains largely ceasing in March and less than 0.4 inches (1 cm) of precipitation being recorded for the 5½ months prior (records from the National Archives). This was coupled with multiple katabatic wind events (known as “northers” or Santa Anas) that month, one of which occurred about 10 days prior and likely added to the dryness of fuels. Temperatures during the week prior remained high and were coupled with several severe fires in San Diego County in which “at least 10,000 acres [40 km2] have burned over, a dwelling house consumed and other property destroyed”. It’s like déjà vu all over again, right??? 129 YEARS AGO, and the conditions were the same as California is experiencing today. Gee, how can that be when California wouldn’t have had many – if any – cars back then? And how fascinating is it to see that 45 years after that fire (and before the fight over climate change vs. forest mismanagement) the Assistant Regional Forester commented on the absence of fires since forest management began? That’s a perfect example, CW, yet the climate alarmists never stop repeating the same old song about it being man-made, or caused by jet streams, or straws, or you-name-it. And I won’t even get started on how many millions of gallons of water are being used and further depleting limited supplies. Now Trump is trying to tell them that we’re tired of paying for their bad (or missing) management, so naturally he’s caustic, he doesn’t care and it’s his fault. I don’t know if that fits in a tweet but Trump could go outside the box now and then and put out an official statement. Agreed, CW. I can’t count the times Trump’s gotten the cart before the horse in some of his comments, but then, like we knew going in, he wasn’t going to be all that presidential in his thought process or the presentation. He’s more prone to knee-jerk reactions and some folks have said that he does it intentionally just to rile up the media. I’m not so sure – not this many times.